 Beautiful wooden chess set with an old German Knight design.  Ideal for playing tournament chess.  Great value for money considering the quality of the product. After your kid has learned to play chess using a chess book such as Chess for Kids or the game No Stress Chess that teaches how to play chess, you can move on to a beautiful chess set. A beautiful chess set is nice to have at home. Thechessstore.com is a site specialized in high quality chess products. Therefore, if you are looking for beautiful chess sets, look no further. 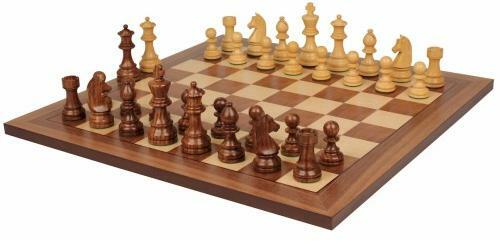 The company offers chess sets of various designs. We recommend the German Knight Staunton Chess Set. 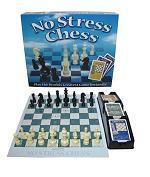 It is one of the most popular sets offered by The Chess Store. It has an old German Knight design and it includes a walnut chess case made from solid walnut, walnut and maple veneers. The chess board measures 17.5" with 1.875" squares. Two extra queens are also included. The Chess Store also offers the German Knight Staunton Chess Set in Ebonized Boxwood which also includes a walnut chess case. It has two large drawers (one on each players side) for storing pieces. It is another of the beautiful sets that we recommend, perfect for a coffee table or a game table and for decoration in the house. Overall, these products are great value for money considering their quality, beautiful look and the fact that they both includes a case. These sets are ideal for spending hours playing tournament chess or just for decorating a table. Also they are a great idea for a (birthday) gift even for an adult. For more information on the benefits of chess, please visit our kids chess games where you will also find information on games that teach how to play chess. We also recommend that you take a look at our page related to Sudoku. Sudoku is another game that can help kids develop logic, judgment and concentration.